In her kitchen at Rose’s Red Door Inn, executive chef Caden Holt is calm, collected, and competent. But when her boss asks her to show off their beautiful island to impress a visiting travel writer and save the inn, Caden is forced to face a world much bigger than her kitchen–and a man who makes her wish she was beautiful. 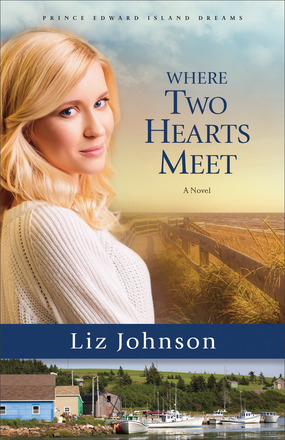 Wonderful characterization and an engaging plot make Where Two Hearts Meet a delightful read! I love visiting Prince Edward Island and the fictional bed and breakfast Liz Johnson has created. The sights and sounds of the Red Door Inn and the island come to life with each turn of the page. Full of sweetness, from Caden’s cinnamon rolls to her relationship with Adam, Where Two Hearts Meet is a tantalizing and enchanting tale. I thoroughly enjoyed this story and am eager to continue the Prince Edward Island Dreams series!